In the previous article, I looked at a selection of paintings by Sir Lawrence Alma-Tadema (1836–1912) up to 1873, by which time he had settled in England and established himself as a successful painter, and was becoming well-known for his exquisitely detailed and thoroughly-researched paintings of classical Greece and Rome. Lawrence Alma-Tadema (1836–1912), Sunny Days (1874), oil on canvas, 22.9 x 35.6 cm, Yale Center for British Art, New Haven, CT. Wikimedia Commons. 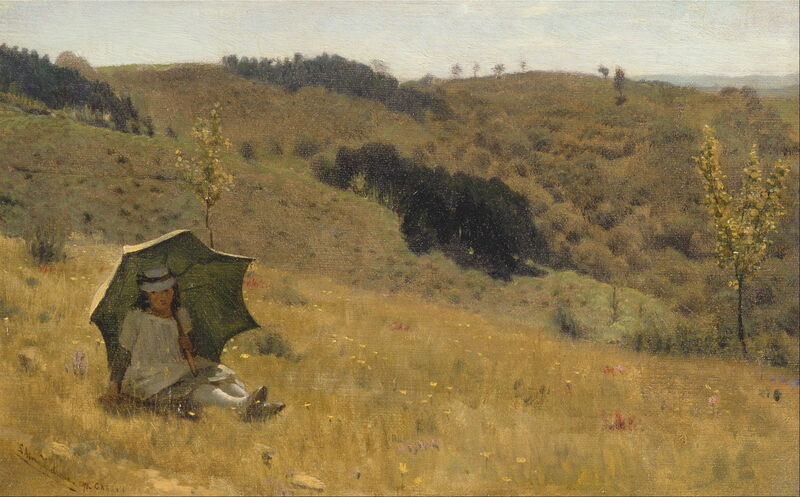 Sunny Days (1874) may come as a surprise to those who know Alma-Tadema for his Salon-style works, but during the 1870s he started painting small landscapes, typically of his family when they were on holiday. This shows his daughter Anna in what could be seen as the closest that he came to Impressionism, and was perhaps modelled after one of Monet’s paintings of the time. On this occasion, the landscape is only in Surrey, but he also painted these when in mainland Europe. They were not intended for sale, although this was exhibited in the Dudley Gallery, then given as a present to the young painter John Collier. Several have come onto the market in recent years, and may bring revisions in accounts of his work. 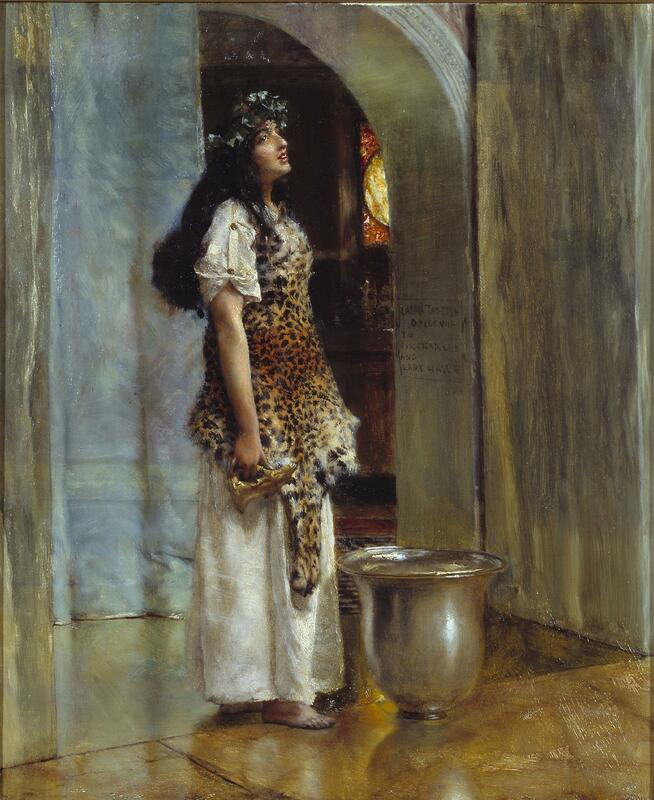 Alma-Tadema was made a full member of the Royal Academy in 1879, and travelled repeatedly to Italy and other parts of continental Europe to research subjects for his paintings. Sappho (and Alcaeus) (1881) is one of his finest and best-known classical paintings, and shows this famous Greek poet. Although now associated popularly with lesbian love, in fact very little is known about her life, and only fragments remain of her poetry. She was probably born around 630 BCE, may have fallen in love with Alcaeus, a contemporary poet, and according to legend killed herself by jumping off the Leucadian Cliffs because of her love for a ferryman. Given the shortage of evidence, there is ample room for speculation and fantasy. 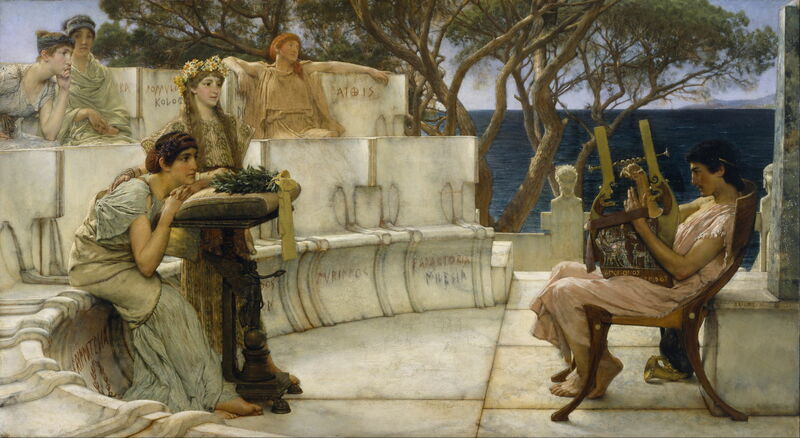 Alma-Tadema shows Sappho resting on a lectern and staring intently at Alcaeus, who is playing a lyre. She is supported by her ‘school of girls’, one of whom rests her arm on Sappho’s back. The artist’s hints at a lesbian interpretation are subtle: the marble benches bear the names of some of her (female) lovers. 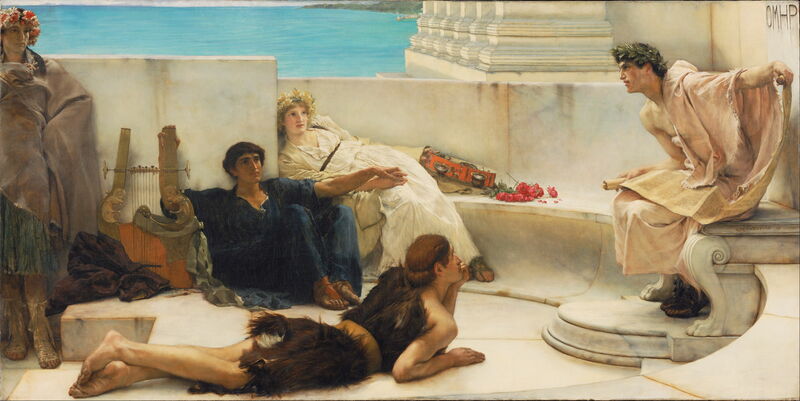 Alma-Tadema also invokes two additional arts, poetry and music, in a setting which is only very lightly narrative, and thus appears to conform to the aims of the Aesthetic movement. Lawrence Alma-Tadema (1836–1912), A Reading from Homer (1885), oil on canvas, 91.4 × 183.8 cm, Philadelphia Museum of Art, Philadelphia, PA. Wikimedia Commons. A Reading from Homer (1885) was painted by Alma-Tadema for the music room of banker Henry Marquand’s mansion in New York, a project on which Alma-Tadema worked with Frederic, Lord Leighton, between 1884 and 1887. Homer sits at the right, under the truncated Greek letters of his name, apparently reading from a scroll. His audience consists of four young people in an odd medley of dress. The couple just left of centre, who are holding hands and have a bunch of red roses to reinforce their affection, also hold musical instruments: a lyre and tambourine. Although these instruments might be very appropriate for a music room, once again Alma-Tadema has referenced two other arts, literature and music, and supplied very thin narrative. A Foregone Conclusion (1885) was commissioned as a wedding gift to the second wife of Sir Henry Tate (founder of the London gallery), Amy Hislop, by Tate himself. 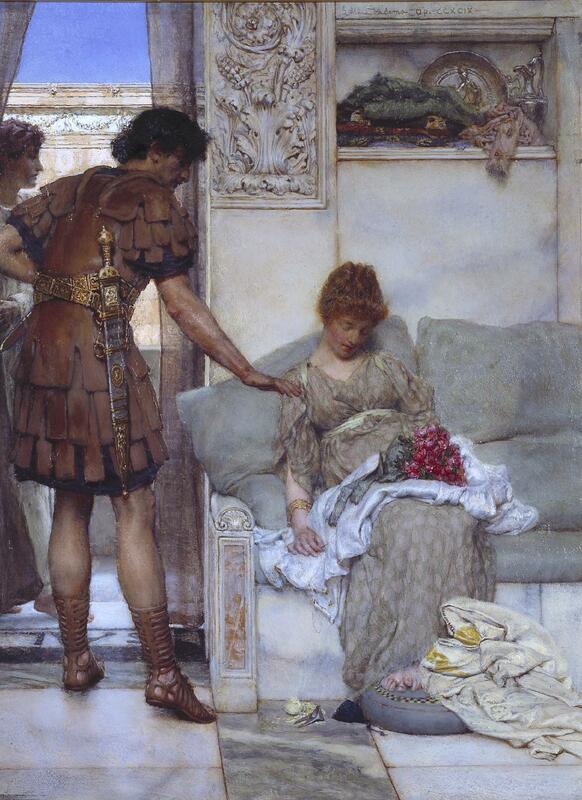 It is one a series painted by Alma-Tadema on the theme of courtship and marriage: this shows a suitor (left) bringing an engagement ring to his girlfriend ready for his proposal of marriage to her. She hides behind a marble wall with her attendant, their attitude suggesting that his proposal will be successful. A Priestess of Apollo (c 1888) shows one of the priestesses devoted to the god of the sun, who rode the chariot of the sun across the sky each day. Alma-Tadema signed this painting in the inscription under the arch, dedicating it to Sir Charles Hallé (1819-1895), the famous conductor who founded the Hallé Orchestra in 1858, and his second wife, the widowed violinist Wilma Neruda; they married in 1888, and this appears to have been another wedding gift. A Silent Greeting (1889) was a further commission by Sir Henry Tate, as a companion to A Foregone Conclusion (1885). Its story is even simpler: a young woman has fallen asleep, exhausted, a bouquet of red roses on her lap. Her right hand holds a needle, with which she had presumably been sewing the garment on which the roses rest. Her partner gestures silently towards her – perhaps having just put the roses on her lap – as he steps outdoors. Lawrence Alma-Tadema (1836–1912), Spring (1894), oil on canvas, 179.2 × 80.3 cm, J. Paul Getty Museum, Los Angeles, CA. Wikimedia Commons. 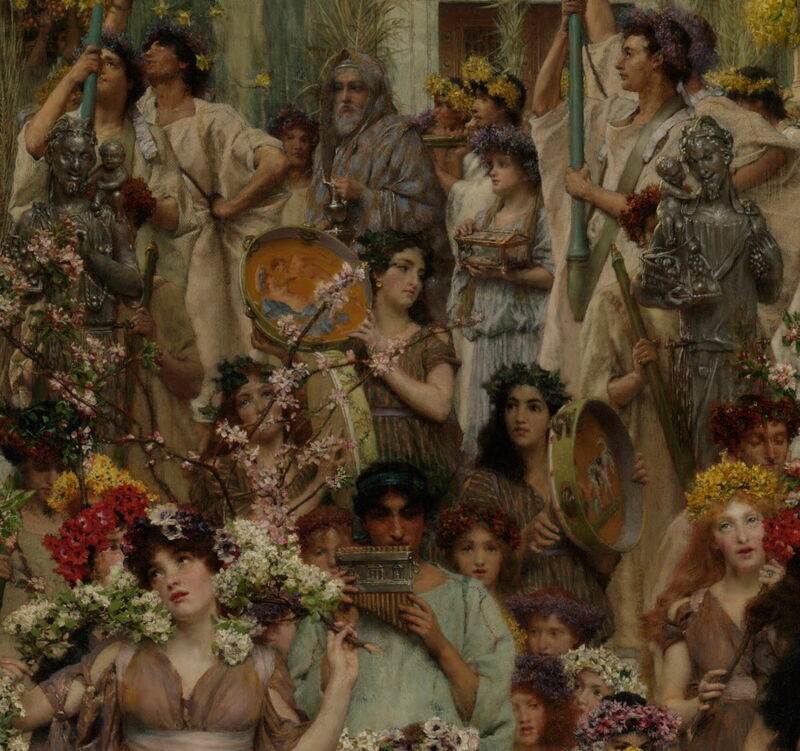 Spring (1894) is one of Alma-Tadema’s largest and most complex paintings, which took him four years to complete. It shows the spring celebrations in honour of the goddess Flora, the April Florialia. Lawrence Alma-Tadema (1836–1912), Spring (detail) (1894), oil on canvas, 179.2 × 80.3 cm, J. Paul Getty Museum, Los Angeles, CA. Wikimedia Commons. Hidden in its extravaganza of flowers, marble, pretty girls and young women, are some rather ruder references. The banner at the back of the procession, hung from a balcony, contains verse addressed to Priapus, the god of fertility. This was amplified by attached lines from the contemporary poet Swinburne, which continued by referring to the budding of sexual love in the spring, although those lines remained unquoted here. Finer details on some of the instruments and other objects in the painting show couples frolicking in a state of undress, and there are herms concealed in other parts. The painting was purchased by Robert Mendelssohn-Bartholdy. In 1899, Alma-Tadema was knighted, and in 1900 was awarded the Grand Prix at the Paris Exposition Universelle. A Favourite Custom (1909) is perhaps Alma-Tadema’s lushest marble spectacular, with its ingenious immersive trick for rendering its two nudes more acceptable. The artist based this on the Stabian baths he had seen and photographed in the ruins of Pompeii, dressing them with extensive marble to make them far more imperial and luxurious than they actually were. In the distance, the main entrance opens out onto the street, through which there is a steady stream of women coming to bathe. 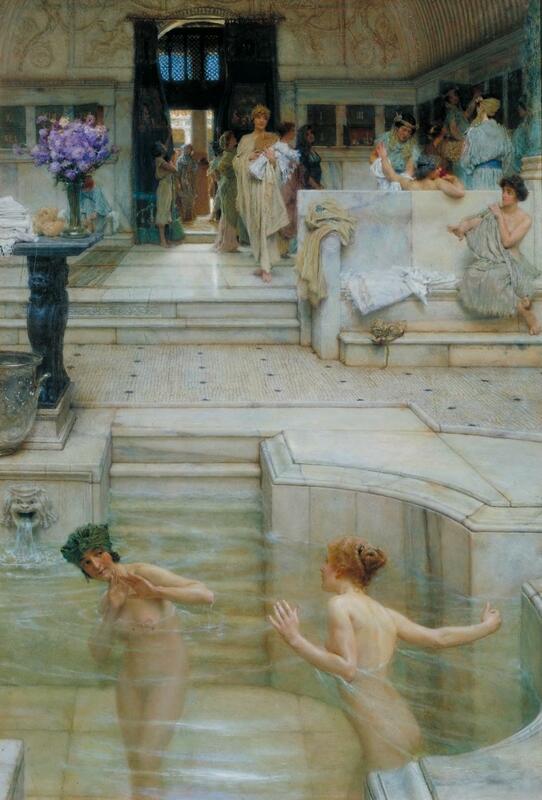 The two bathers in the foreground are standing immersed in the frigidarium, a cold bath, in which they playfully splash one another. When first exhibited, this small painting was very well received, and was immediately purchased for the National Gallery of British Art, now known as Tate Britain. Lawrence Alma-Tadema died in 1912, and was buried in Saint Paul’s Cathedral in London. During his career, his paintings (complete with lucrative reproduction rights for prints) fetched as much as £10,000. By the 1920s, they were only worth a few hundred pounds at best, and some could not be sold at all, even as late at 1960. By 1995, his better paintings were selling for more than £1 million, and in 2010 one of his paintings set a record price of $35 million in New York. Such are the vagaries of taste. Did the paintings of Lawrence Alma-Tadema, like those of Frederic, Lord Leighton, pass from historical narratives to the Aesthetic movement? I don’t think that this is as clear cut, but many of his paintings made after he settled in Britain in 1870 show most of the hallmarks of Aestheticism. He certainly moved in artistic circles which had strong Aesthetic influences, and met and collaborated with Frederic, Lord Leighton, and others now considered to have ‘joined’ the Aesthetic movement. Yet Barrow’s superbly-researched and -illustrated monograph on Alma-Tadema’s life and work does not even mention the term. 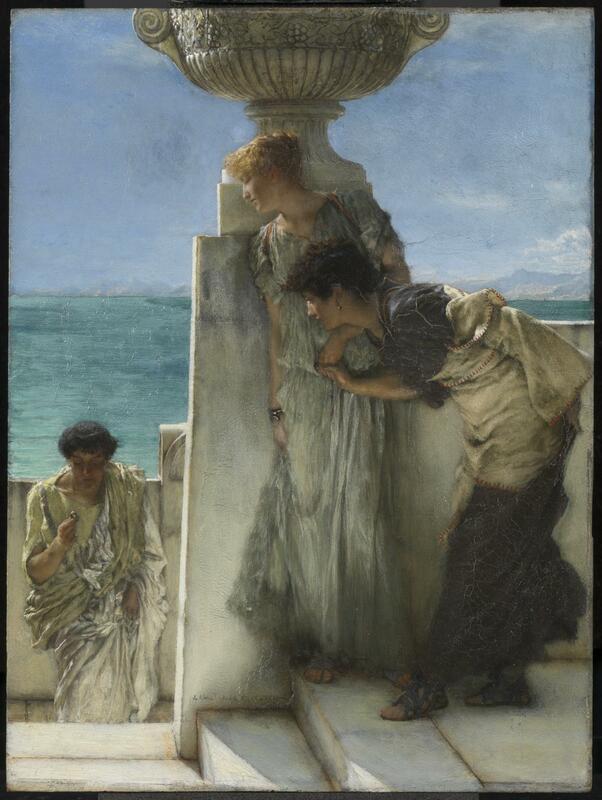 Posted in General, Painting and tagged Aestheticism, Alma-Tadema, Collier, Leighton, narrative, painting. Bookmark the permalink.